This isn't a new recipe. 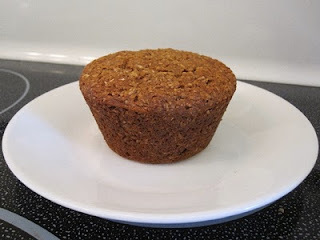 It's my current favourite Raisin Bran Muffin sans raisins, and sans oil, and that's where it gets interesting :). Truth-be-told, the only reason there are no raisins is because I didn't have any. And the only reason I didn't have any is because I couldn't find them in my bloody grocery store. Aren't remodels wonderful? (The correct answer is "no") While I'm on the topic, I'm sick of this trend to make all grocery stores feel like food warehouses. My current grocery store is one of the last chains with a smaller "market feel"; a time before it was possible to purchase a keg of mayo and a pair of jeans in one trip. But the owners have decided to "upgrade". Joy. I'll be sure to remember my forklift next time I need to pick up some eggs. I digress. 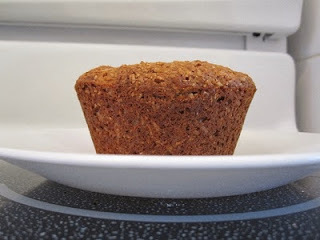 So the real reason you should care about these muffins is because I replaced all of the oil with unsweetened applesauce. This is something I have been doing since I started baking and can be done with most quick bread/muffin recipes. Really the only difference in flavour you might notice is that the muffins may not taste as “buttery/rich” without the added fat. There can also be a slight difference in texture. The muffins may be a tad dryer, slightly chewier, and with a a top a little less crispy than normal. However it's a minute difference and is barely worth mentioning, most won't even notice. Besides, if you're the type of person that would do this in the first place (as I am) the difference is negligible when considering the number of calories and amount of fat you're not consuming (even more significant if you enjoy jumbo muffins). Though if you're still concerned you can choose to replace only a portion of the fat. (It's also important to be extra careful to not over-mix your batter, this is key too preserving the texture). On a side note: The keen eye may notice that these muffins did not rise as high as the full fat version. However, I believe this to be a result of the lower volume of batter due to the missing raisins. I could explain the reason why this substitution works but we both know you don't care (don't worry I understand) and it's time better spent putting it to test. When it works just remember who told you :). I accept cash as well as all major credit cards (no AmEx please). I also take payment in peanut butter and peanut butter products; oh M&Ms too, peanut or pretzel. Mmmmm.... M&Ms. Wait what was I saying...? Preheat oven to 375F and position rack at top 1/3 of oven. Grease or line 6 jumbo muffin cups with paper liners. If using raisins, in a cup or a small bowl soak raisins in hot water for 10-15 minutes. In another bowl whisk together oil, egg, sugar and vanilla. Add dry ingredients to wet and stir until just combined, being careful not to over-mix. If using raisins remove from water and fold into batter. Distribute batter into prepared muffin tin and bake 20-25 minutes or until toothpick comes out clean (this took me 22 minutes). Allow to cool in pan on rack for 5 minutes before removing and serving.